In today’s competitive environment, it is important for web designers to understand what design elements are essential for attracting visitors, making the visitor trust the website, and perform intended actions like placing an order and revisiting the site. Trustworthiness of a website heavily relies on a good first impression and visitor’s visual perception of the user interface. 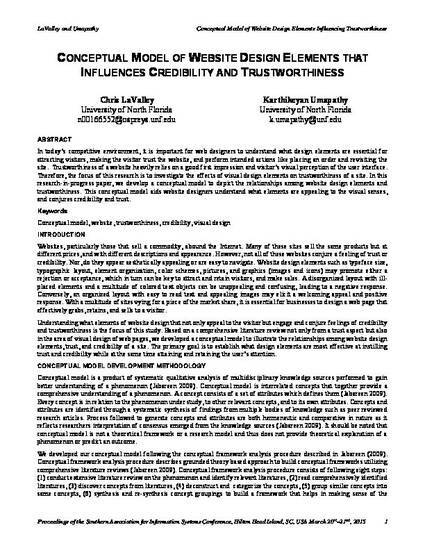 Therefore, the focus of this research is to investigate the effects of visual design elements on trustworthiness of a site. In this research-in-progress paper, we develop a conceptual model to depict the relationships among website design elements and trustworthiness. This conceptual model aids website designers understand what elements are appealing to the visual senses, and conjures credibility and trust.